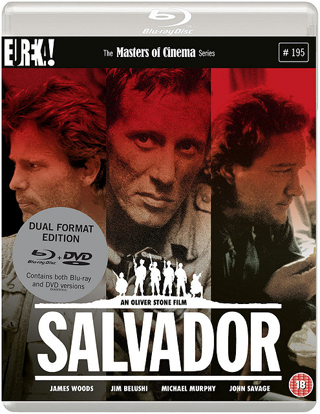 Salvador – Film Review. Oliver Stone epic now on Bluray for 1st time. By now, self-respecting film fans should know what to expect from Oliver Stone. The writer-director is well known for making hard-hitting dramas, but that was not always the case. Before the likes of Platoon, JFK and Wall Street transformed his career, he was a jobbing scribe, best known in Hollywood for writing and directing the universally panned horror film The Hand, which Michael Caine agreed to star in so he could pay for the building of a new garage. So when James Woods heard that Stone wanted him for his latest project, he almost turned it down without even reading the script. Thankfully, he relented, because it’s hard to imagine Salvador being as impressive with somebody else in the lead role – Woods has the kind of lean looks and intelligence that somehow suit the character of photojournalist Richard Boyle. 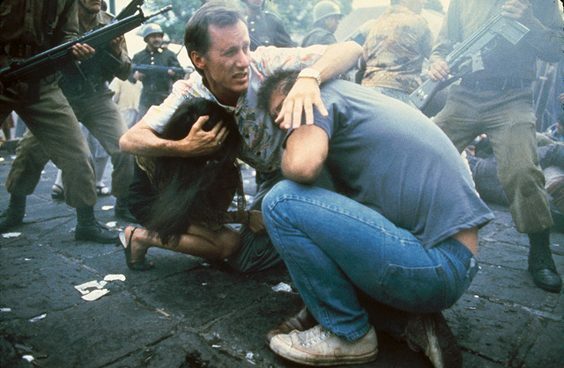 Stone co-wrote the screenplay with Boyle; it’s based on his experiences in 1980 El Salvador. When we first meet him, Boyle is struggling to make ends meet – his penchant for booze, women and drugs have given him a bad reputation, despite his willingness to deliver reports from the world’s hotspots. After his wife leaves him, taking their child with her, he and his DJ pal Doctor Rock head to El Salvador, where Boyle is convinced he can land some lucrative work via contacts in the country, which is in political turmoil. However, on their arrival, a shocking scene quickly makes them realise they’ve stumbled into something far more dangerous than they originally imagined. Stone pulls no punches in his depiction of the violence and savagery at play on the nation’s streets, or in his depiction of Boyle. When the film begins, he’s an unlikable, self-centred character, and although he remains driven, you eventually get the impression he’s reporting out of a sense of duty and revulsion at what he’s seen rather than for money and to feed his own arrogance. There’s even a surprisingly tender love story; you feel the pain and frustration Boyle also experiences at the shocking final denouement. Woods is ably supported by Jim Belushi as Doctor Rock, a man accidentally caught up in something he doesn’t understand and doesn’t want to get involved with, while familiar faces such as John Savage, Cindy Gibb and Tony Plana also appear. The disc is packed full of special features made both at the time and subsequently, giving viewers a wide range of fascinating extra details.